— scanning on all ports is carried out on traffic transmitted via Dr.Web-supported protocols, including secure connections (if the user has enabled the option to scan SSL traffic). — with secure search, Google, Yandex, Yahoo!, Bing and Rambler will only return links to content considered safe by the search engines and Dr.Web. Dangerous sites will be excluded from search results altogether! — traffic filtering for instant messengers such as Mail.Ru Agent, ICQ, and Jabber. Links leading to malware and phishing sites are removed from messages. The anti-virus scans transmitted attachments. The transfer of potentially dangerous files is blocked. Scans encrypted SSL traffic (HTTPS). Access is blocked to sites used to distribute malicious or potentially dangerous programs, phishing sites, and sites using social engineering techniques to misguide users (more). A separate database of sites that distribute unlicensed content offers protection for copyright holders. Disable the scan of outgoing or incoming traffic and create a blacklist of applications whose HTTP traffic will be scanned no matter what (blacklist). Define applications whose traffic will not be scanned (whitelist). Prioritise the traffic you want to scan (i.e., do a balance test). Balance CPU load and Internet bandwidth usage. Filtering does not affect overall system performance, surfing speed, and the amount of traffic transmitted. Thanks to the redesign of the Dr.Web Net filtering Service traffic interception routines, downloading files from the Internet has become much faster. The revamped routines for scanning media content ensure that online video and audio is streamed without delay. CPU usage for file transfers via browsers and download managers has decreased significantly. Fans of Dr.Web and online games will notice the difference in scanning speed! Traffic generated by applications with valid digital signatures. 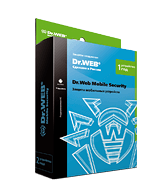 The new settings will help prevent conflicts between Dr.Web and third-party applications during traffic filtering and yet maintain the desired security level. URLs get checked on Doctor Web's servers via Dr.Web Cloud. As a user goes to a website, the respective URL is sent to Doctor Web to determine whether the site is safe to visit. The URL is examined in real time regardless of what the update settings are or how current a computer’s virus definitions are (more).